The next morning we each ‘downed’ a coffee before ‘hitting’ the road. Ciudada Victoria is less than 260 miles from the border. It should be an easy day. I still don’t like the noise the bike is making. Yesterday I bought three quarts of Mobel-1 and changed the motorcycle’s oil right at the hotel, anything to help go one more day. I didn’t know what else to do. The noise the bike is making seems worse then the day before. My mind is racing. I know this bike needs a shop but I think it can ‘make’ the border. I just don’t want to stop here, on this side. We ride. I convinced myself the noise is piston related. It’s performing well and the noise goes away when I pour on the gas. I tell Heidi that I think we have a busted ring or cracked piston skirt or something. 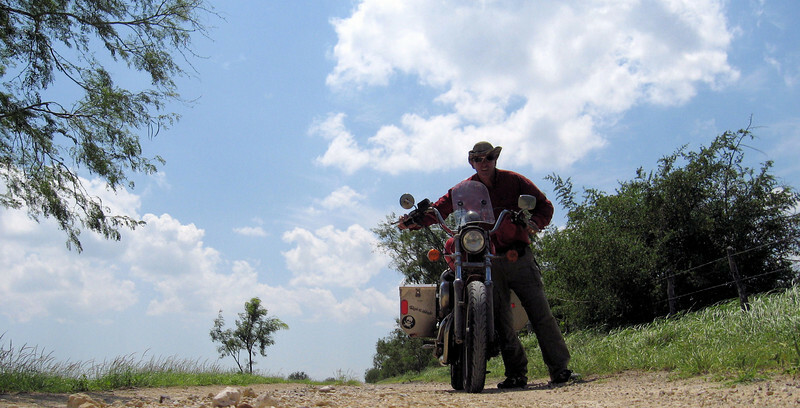 I say “I rode a bike over a hundred miles with a busted piston once” I tell a story about Jessie from ‘Jessie Luggage’ He was in South America back in the seventies when a truck sideswiped his BMW and tore off a cylinder head. 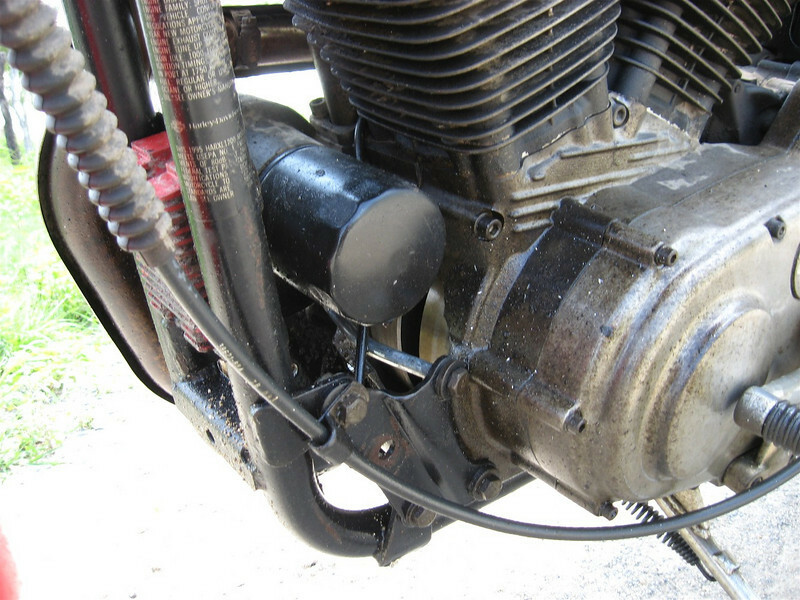 He plugged the hole with a rag and rode on to safety with just one cylinder. I tell Heidi I’m convinced we can do the same if we have to. I hope it was convincing because I don’t like it. We stopped for breakfast here once before. It’s a small Mezcal distillery and restaurant. We have 150 miles before the border. Heidi notices our water bottle is gone. It must have fallen off. We must always carry water. Now the landscape is dry with some rolling hills and fenced in farm lands. 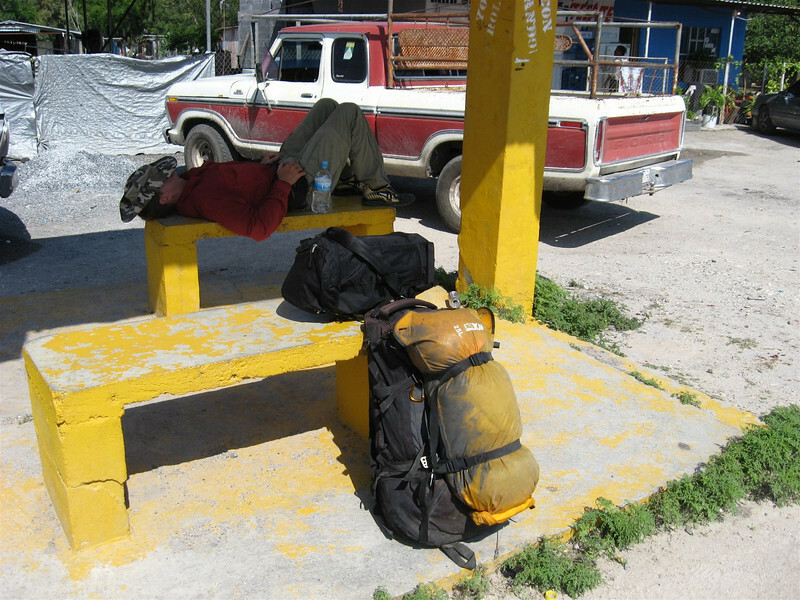 I pull into a Pemex station at a crossroads to buy a liter of water and chill. Heidi thinks I’m nuts because I like coffee when its hot outside. Today I did agree. There are a lot of big-rig semi trucks parked here and several shady looking dudes just sittin’ around outside the store in the hot sun. Heidi stayed by the bike when I went inside to get the water. I didn’t have to ask, I knew she was standing guard. A few of these guys looked in rough shape. I think about all the thousands of people crossing the U.S. border illegally and envision them as one of the thousands who didn’t make it. I feel for these people but there’s no denying it, the closer we get to the U.S. Mexican border the spookier and more ‘wild-wild west’ everything feels. We are back on the road and 70 miles before the border when the sound of the engine changed. It got real loud for a while then in a second it went from an ‘annoying tick to ‘something is seriously wrong’ to ‘something broke’. Heidi is jabbing me to pull over. We talk. I say “We still have one cylinder running” I tell her I think we can make it. I make the call to slowly proceed on. Heidi looks at me as if I’ve just ‘gone mad’. We start riding along the side of the road with our flashers going. We were doing 35 MPH with little effort. Then ‘Boom-Boom Bang!’ Heidi yells out “Something flew off the bike!” I yell back “You Better Be Right!” The noise was less now and I didn’t want to stop. We pull over and again Heidi is right. Something did fly off the bike, a 5 inch diameter chunk of metal from the engine. Oil was all over my boots, my pants, the bike and the road. This is it, it’s all over. The bike is done for the day. It’s sunny and it’s hot and there is nothing around us but fenced in farm land. We can see no shade of any kind in either direction. We stay calm and cool, that is, after we first freaked out a little about the engine and our situation. “Number one” I said “we gotta get the bike off the road and find some shade” Back a 100 yards we see a gate and a driveway to a farm, or that’s what we suspect. 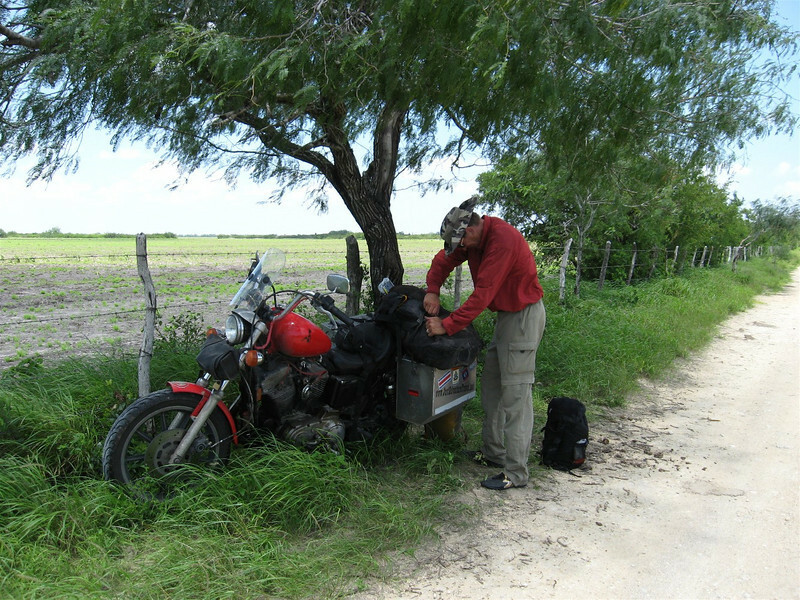 When I’m getting ready to ride south of the border people like to ask me “What are you going to do if you have bike trouble down there?” My answer always includes “Prepare for adventure” I think all adventure riders spend time rehearsing catastrophic scenarios in their head. For-sure solo riders do. I like to ‘envision’ my course of action and ‘see’ the resolution. Sometimes the visions quicken my pulse and give me a lump in my throat. It’s natural. It’s a key to survival. The physical risks and uncertainty rocket every fiber of your being into a mode. It’s a physical and mental zone. I think it’s addictive. We need to abandon the bike. I will not leave Heidi alone, so that means we both go off on foot to look for help. Leaving the bike along means we need to stripe everything off, (everything). Assume that anything left on the bike will be stolen. Once we leave we have no idea how long the bike will sit alone. We are not happy but we seem to have it under control. We talk about our status and options. We are in a safe spot. The bike is in a safe spot, for now. Next we need to secure our gear. Heidi and I start making three piles on the ground. One pile for stuff we don’t want and are throwing out. Another pile for gear and supplies we want to carry-out with us and another pile for the stuff that’s staying here and getting buried. We discuss scenarios while we go though the gear. Heidi analyzes every item she has as if she’s into this as much as I am. We talk about our two possibilities now. 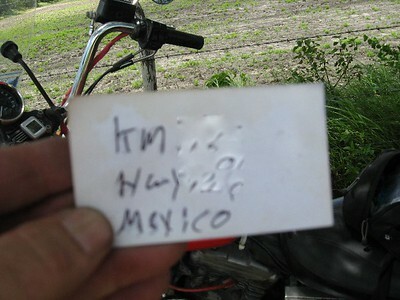 One; we get the bike trucked to the border then deal with the bike and us on the US side. Two; park the bike here and just deal with us getting out. Then, come back for the bike later. 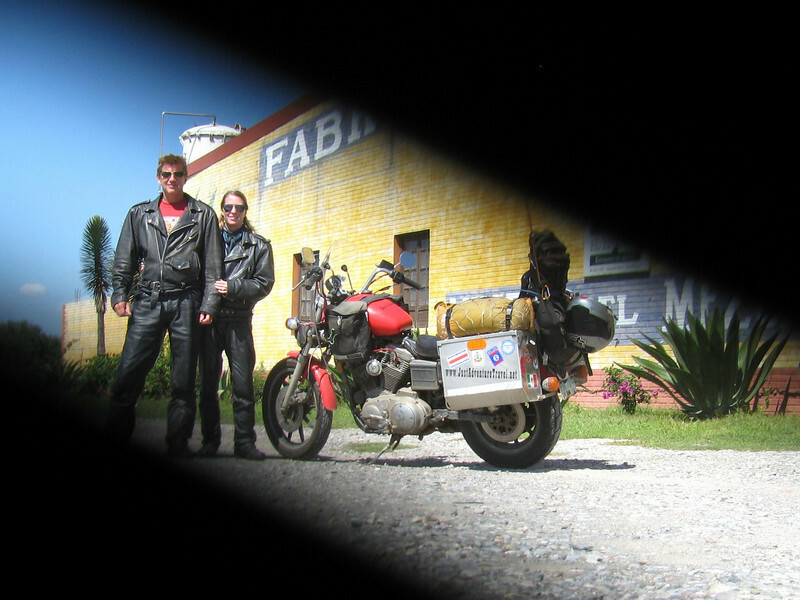 No matter how much we both want to get the bike out of here and to the U.S.A. now, we had to agree, it’s most likely going to be option two; park the bike as safe as we can and ‘get outta here’. Everything comes off, even that nasty tool bag. Heidi and I have the bike completely stripped. We each have one backpack. Heidi has a small day pack and I have the big pack. The majority of all our stuff is buried. We start marching down this long dusty driveway to seemingly nowhere. Heidi is a little nervous. We continue discussing different scenarios as we walk. Finally after a mile and a half we reach the farm. It’s a cluster of buildings around a small open area. There are three barns, the farm house and a couple stables. Heidi and I called out from the middle “Hola, hola. Hola!” We kept this up for a long time and got no response. We see a dog but he wouldn’t even lift his head. This is weird. Suddenly a loud jungle sound starts off like a siren “EerAarr! EerAarr!” Then we see two huge and brightly colored peacocks walking toward us. Next we see a woman peek from around the back. I’m glad I have Heidi with me at this point. If the farmer’s wife is here alone, having Heidi with me will be much less threatening. Heidi walks up to the farm house and greets the woman. Heidi fires up her best Spanish. We are ‘in’. We can park the bike here and all is good. I march off to get the bike and push it back. 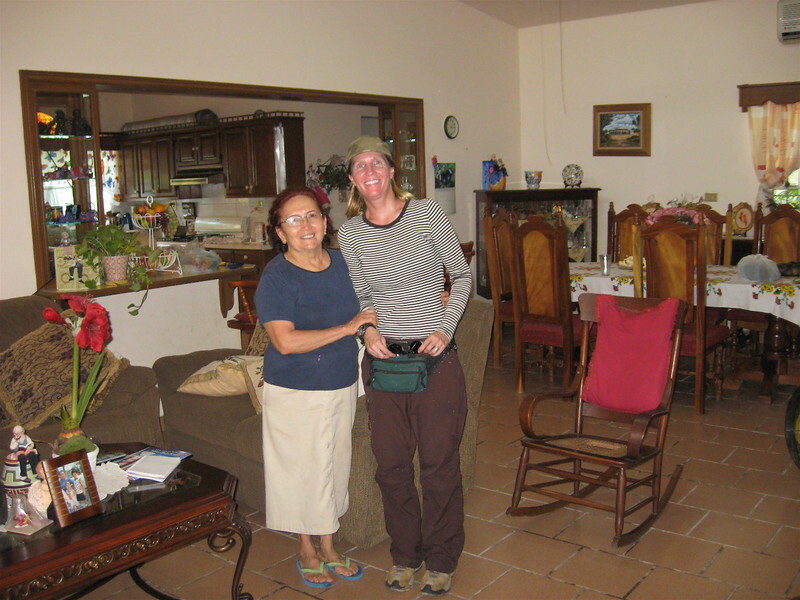 Heidi stays here with the senora at the farm house. Half way down the driveway the farmer picks me up in his truck. I explain what our situation is. ‘We have been traveling. We mechanically broke down. 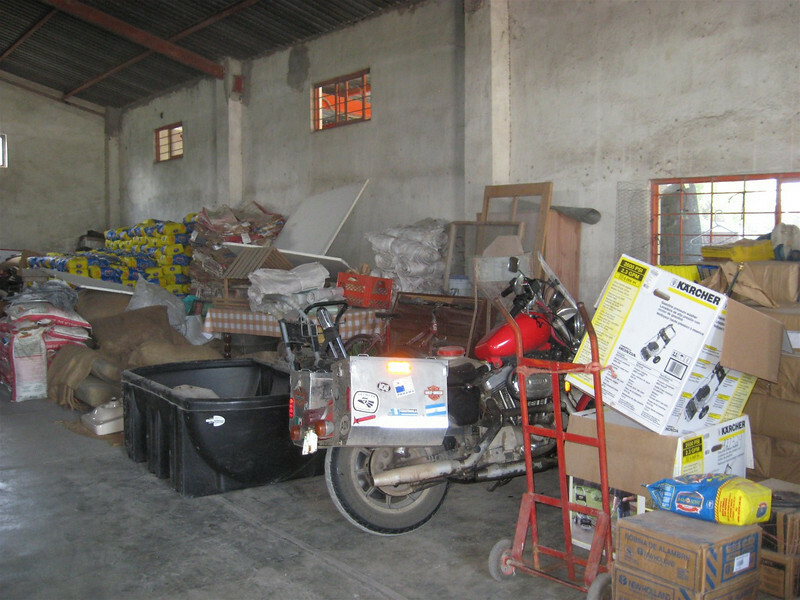 I would like to park our motorcycle at your farm for a couple of weeks’. He drives up the road to his brother-in-laws ranch who speaks English. He’s not home. I try again to explain in my best Spanish, what my problem is. This time I make a little more sense. He really got it when he saw the line of oil running down the shoulder of the highway that ended just past his driveway. That said it all, he knew we are in serious trouble and need help. He does everything to assure me that all is OK and he has a good spot for our bike to park. I get dropped off at the bike and proceed to push it to the ranch. 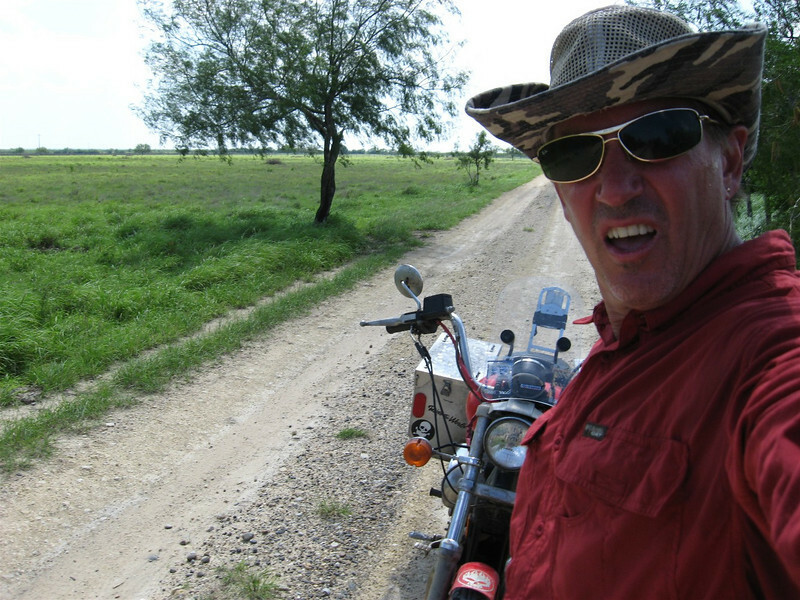 OK, I can push the bike to the ranch (Arrg…). A key to pushing a bike long distance is rest & hydration. I’m going through some kind of ‘out of body’ euphoric experience. I take a few deep breaths and start chanting. I’m not sure if I’m doing this out loud or to myself. “Heidi and I are good. The bike is good. These people are great. We are lucky again” The bike feels light to push. It will be parked at the ranch soon. 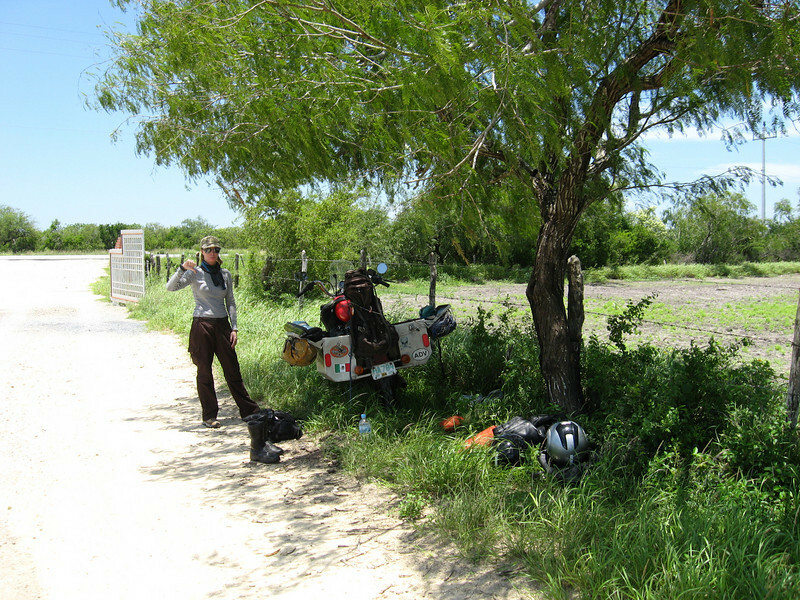 This ranch is on a major highway, 70 miles from Reynosa and the U.S. border. I’m sure a bus will run down this highway, they have to, if not tonight then tomorrow. I start thinking about the next stage of our mission. 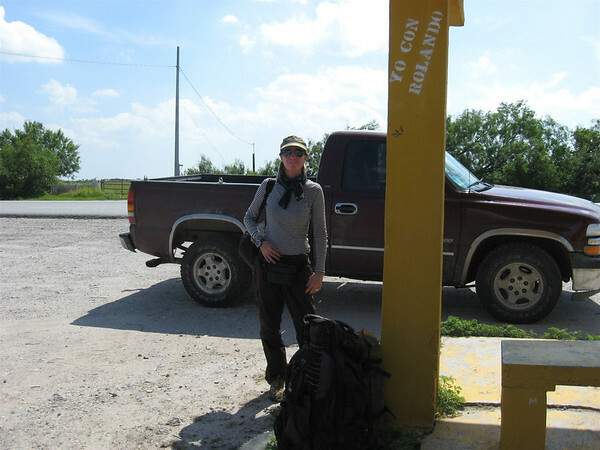 If we get to Reynosa tonight we should get a hotel then cross the border on foot in the morning. The bike is good and we are good, that’s all that matters. This mission will be complete after Heidi and I and the motorcycle are back to northern Wisconsin. I am focused. I am pumped. I see a vision of completion and success. I plan for catastrophic events and this for sure counts as one. ‘Strip the bike. Stash the gear. Prepare for adventure’. We still need to make a lot of things happen today, but at least I see no major problems ahead. Heidi and the senora are waiting for me back at the ranch house. Heidi talked about how sweet the woman is. Heidi said she couldn’t stop thanking her and telling her how kind she was. The Senora said that it was nothing and that if her family was in trouble she hoped someone would help them like they were helping us. Heidi started to cry when she told me the story. We were invited for dinner and a place to sleep that night. We thought we had a chance to make Reynosa before dark today so we needed to get going. We all exchange names and addresses then Heidi and I were ready to walk off down the driveway and wait for a bus. Instead Emanuel leads us out of the house to his pickup truck then drives us several miles to a bus stop. On the way he shows us all his land and tells us what he grows and for what. Emanuel says he has strong beef cattle because he feeds them soybeans. The bus stop is in the middle of nowhere. We have three hours of daylight left, should be no problem getting to Reynosa. I try to play my character as good as I can. ‘I’m broken down in Mexico. I’m trying to catch a bus to anywhere. The mechanic sells water, pop and beer. I buy a beer. I buy two beers’. Buses go by and by but don’t stop. It hasn’t been an hour yet. I tell Heidi to relax. I say “If we aren’t on a bus in three hours I’ll be worried” Then I say “If we aren’t, I’m sure someone here will put us up” This outpost has 4 or 5 shack homes along the road. Heidi looked at me with suspicion but she knew I was serious even though I said it with my usual sly humorous tone.